Today is a little bit of a different post (and a quite intrusive/embarrassing post if I'm honest!). Annie over at The Quarter-Life Tales of Annie Bean is hosting a little competition. Actually, its not at all little, its the chance to win £1000 to spend on the gorgeous Laura Ashley range to refresh a room in your house that needs a little TLC! You all know I love a bit of home interior. Ever since I moved into my own home 2 years ago (wow, that's gone so quick! ), I'm always on the look out for something pretty and unique for my home. I always swoon over Laura Ashley items but just never have the money to spend on such things. For this competition I have chosen our main bedroom. You've probably all glanced at the photos thinking 'well that doesn't look like it needs a lot of refreshing!' - Don't let the ruffled cushions and bed runner fool you! Hear me out! Re-wind 2 years. We'd been in our house a matter of weeks, and I was working so hard to try and get it the way I wanted it. My boyfriend had just started a new job the week we moved in (bad timing!) so I was left to do most of the painting and wallpapering myself. Each room in my house has a different colour scheme (I like colour in my life!). 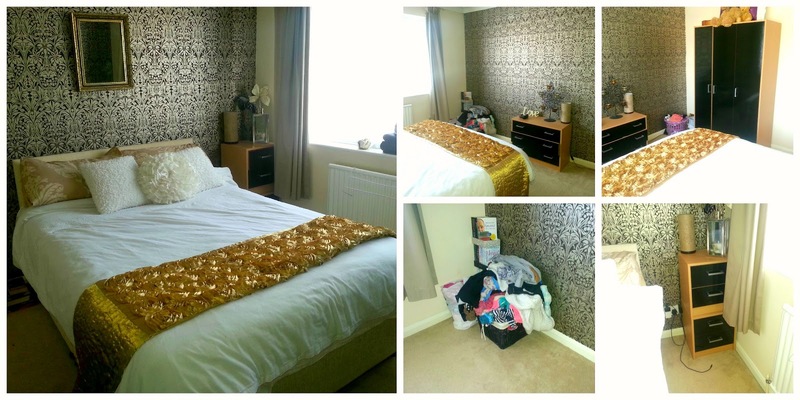 So for our main bedroom I decided to go for golds and browns, simply because I'd never dabbled in those colours before! Within a matter of weeks of moving in, we organized a house warming party. I'm not going beat around the bush here - I wanted my house to look the bee's knee's ready for everyone coming round. A few days before the party, we still didn't have any bedroom furniture, and I was panicking.. so, in true Kate style, I did an impulse buy (as much as my boyfriend told me not to) and settled on some pretty basic furniture from Argos. Due to rushing, I didn't measure up properly when purchasing the furniture, and needless to say, it's miniscule! (I'm sure its children's furniture!) The chest of drawers stand at knee height (and I'm only 5ft 1"!). The bedside cabinet was that low that my boyfriend has to do without one because I thought it looked ridiculous, plus I seemed to use mine more than he did his, so I have 2 bedside cabinets stacked on top of each other! (see bottom right). Although this obviously creates an unsymmetrical dimension to the bed, as I know beds are the main focal point of a room, so this drives me nuts! The wardrobes.. well.. where do I start? They look fairly big in the photo but it is actually a single wardrobe with a few shelves to the side - I have the majority of the wardrobe and my boyfriend has the shelves. But as you can imagine, being female, I have clothes everywhere because they just don't all fit in. I have a basket full in my bedroom (see photo). I have another chest of drawers in another room, full of clothes, then I have boxes full in the spare bedroom. To top all that off, after approximately 1 month of having this furniture, like true Argos style (sorry Argos!) they began falling apart. One of the drawers is now out of bounds. If you look close enough one of the drawers doesn't actually close. The MDF at the back of the wardrobe began to collapse so we tried to fix that. It's safe to say, I just long for some solid, big bedroom furniture so all my clothes are in one place, and my poor boyfriend isn't left with some measly shelves to store his clothes. Fast forward 2 years and unfortunately, we still haven't been able to afford to replace this furniture yet. Oh, and did I mention I've decided I really don't like the colour scheme?! I've decided it looks dark and dreary. I just feel like this room lets our whole house down. I'd absolutely love some white furniture with mirrored accessories against a light grey/silver colour scheme to create a fresh Parisian theme and to also give the illusion that the room is bigger. I've added a few ruffles on the bed for a feminine yet sophisticated touch. 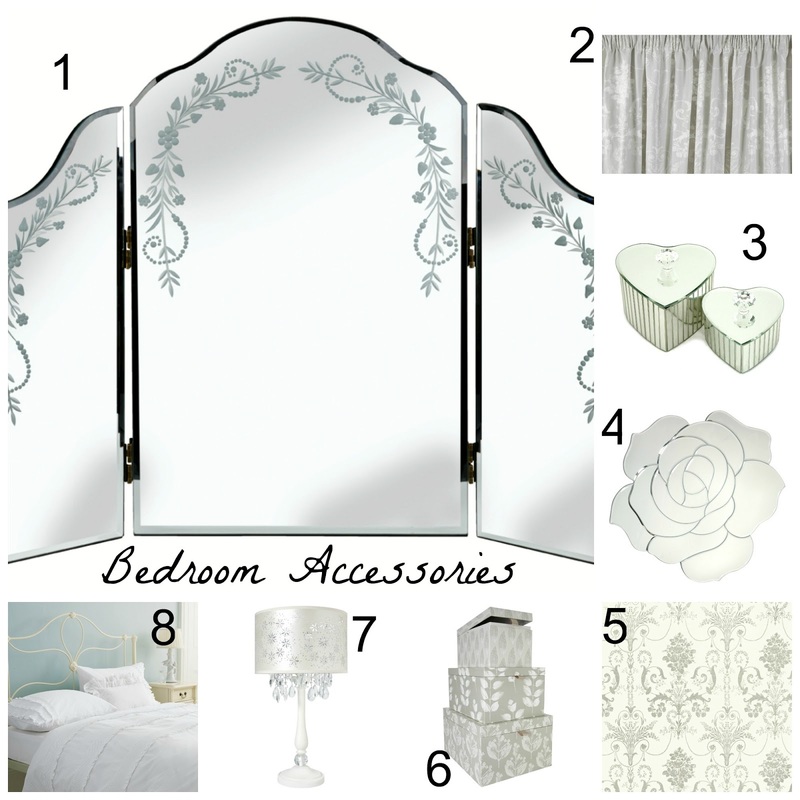 The items I've chosen from Laura Ashley would help make my bedroom the sophisticated and tidy room I'm longing for! As you can see I've gone for solid white wood with lots of storage! All this would help to keep all mine and my boyfriends clothes in one place instead of making other rooms in the house look untidy with clothes that should belong in the bedroom! I would stand the venetian mirror on top of the chest of drawers to create a dressing table. The heart shaped trinket boxes I would place on the dressing table and store jewellery in. The large mirrored rose (4) is a wall decoration that I would place on the wall along with a few mirrored picture frames. I would do 1 feature wall with the damask style wallpaper (5). The lamps I absolutely adore! I would place 1 on either side of the bed on top of the bedside cabinets (so my boyfriend can have his back!). I would have a ruffled duvet set to complete the look of sophistication. If there's still a few oddments that don't quite fit in the furniture (although I hope not!) I would place these gorgeous grey storage boxes in the corner of the room as an extra 'storage back-up'. The curtains I think match perfectly with the colour scheme to finish everything off. I might even add jeweled tie backs! Honestly, if my bedroom was to look like this, I don't think I'd ever want to come out! If you'd like to enter this competition, show us your room that you think needs a refresh, and what Laura Ashley items you'd use to brighten up your room. Then head over to Annie's blog and leave a comment/link telling her you've entered. Also tweet the link to your blog using the hastag #LARoomRefresh. Hurry though, you've only got till June7th 00:00 GMT.